When you plant all these dead humans in the ground, all in a row, it's not surprising that zombies burst forth from that fertile cemetery soil to seek nourishment. If you'd like to grow your own zombie too at your cubicle at work or on your kitchen windowsill next to the herbs without tending the graveyard shift, then get your green thumb ready for this cool new Zombie Planter from Stelter Creative. Not since Audrey II terrorized that little flower shop has a house plant been so voraciously hungry and sinister, except this zombified one requires brains and human flash for food instead of drops of blood. 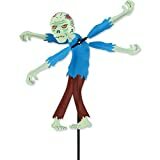 Obviously, this is just an artificial faux zombie plant for decorative purposes only and is made from highly detailed and realistic soft rubbery foam in a little pot with a feeding instructions tag. Even better, this is one plant you can't kill, because it's undead.